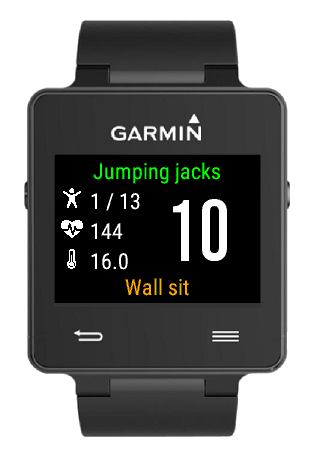 7-Minute Workout (HICT) application for Garmin watches. High-Intensity Circuit Training Using Body Weight: Maximum Results With Minimal Investment. 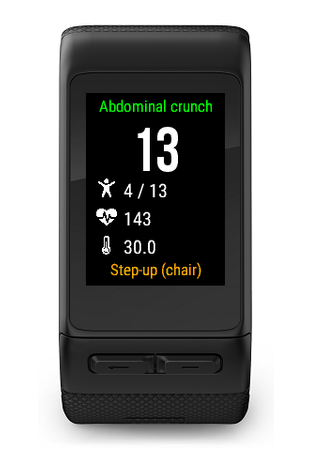 The watch displays a timer for the 30-second exercises followed by 10-second rest period (configurable). 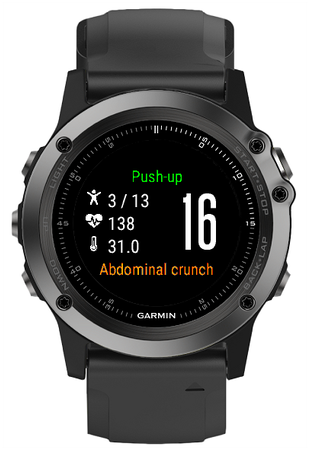 Number of exercises, duration of exercises and rest periods are configurable on the watch menu or through Garmin Connect Mobile. A long vibration will trigger at the beginning and at the end of each exercise. A short vibration will trigger every 10 seconds during the exercise. Sound notification is not supported. The application supports heart-rate monitor (HRM) and temperature sensor (Tempe). If you achieve at least half of the session, the activity is recorded in your Garmin profile. The activity in your Garmin profile will include basic information such as date, time, total activity time. Each exercise and rest period corresponds to a lap. Heart-rate graph is included if a heart-rate monitor is used. Temperature graph is included if a temperature sensor is used. Calories will be automatically calculated if and only if a heart-rate monitor is used. Install from Garmin's Connect IQ Store or from Garmin Connect Mobile. Please submit questions, issues and enhancement requests on this project's issue tracker. Supported languages: Danish, English, French, German, Polish, Russian, Spanish. Source code is made available under the MIT license. Pull requests and translations are welcomed! When forking, please remember to change the application ID in manifest.xml, to prevent issues between both applications on the watch. 7-min is tested on Garmin vívoactive® 3. Add support for repetitive activities in same workout. Add Russion support, thanks to Korneev. Upgrade to Connect IQ SDK 3.0.6. Add Italian support, thanks to Raghnor. Add support for Descent™ Mk1. Add temperature for devices with internal sensor. Add a progress dialog on activity save. Fix font size on vívoactive® 3. Fix issue with start/stop activity (vívoactive® 3). Add support for vívoactive® 3 and Forerunner® 935. Add missing activity type (flexibility) in Connect settings. Add Spanish support, thanks to Mario. Add support for Approach® S60. Upgrade to Connect IQ SDK 2.3.4. Add Polish support, thanks to Uriasz. Change session name based on activity type. Add activity type: flexibility training. Add German support, thanks to Mateo. Add support for fēnix® 5, 5S, 5X. Upgrade to Connect IQ SDK 2.2.4. Add notification policy: none, start and end, every 10 seconds. Add configuration for vibration and tone notifications. Upgrade to Connect IQ SDK 2.2.3. Add support for Forerunner® 735XT, fēnix® Chronos. Upgrade to Connect IQ SDK 2.2.2. Add menu to configure settings directly from the watch. Add configuration for number of exercises. 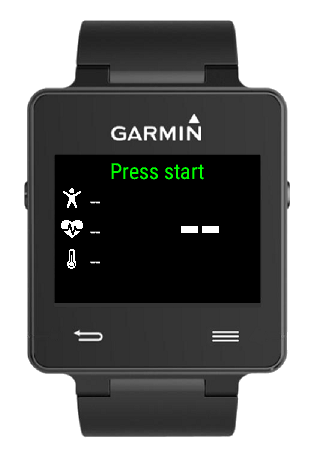 Add configurable activity type: 7-minute, cardio training or strength training. Upgrade to Connect IQ SDK 2.1.5. Change activity type from strength training to cardio training. Upgrade to Connect IQ SDK 2.1.3. Upgrade to Connect IQ SDK 2.1.2. Add Danish support, thanks to Anonymous. Fix display issue on Forerunner® 920XT. Upgrade to Connect IQ SDK 1.2.9. Added confirmation dialog when stopping an active session. Upgrade to Connect IQ SD 1.2.4.